So it’s almost 2012 and as I get a little older each year, I’m trying to become more comfortable with my role as a mentor and influencer of the next generation. When I look at my kids at Christmas and watch all the little behaviors and endearing little qualities that come from me, it’s really amazing how much influence that we can have simply by the example we set in the world. In light of that, I’m going to start the New Years resolution a little bit early this year, and just throw out the goals that I’m going to try to live professionally this year, and hopefully rolemodel out to the next generation. To be honest, it’s not really a New Years resolution since these are pretty much the goals I tried to live by last year too. But here they are. Hope you enjoy! 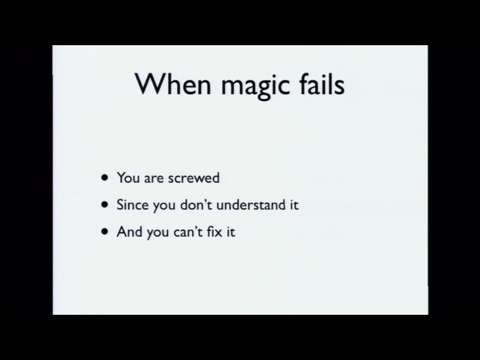 Note: So, I blatantly stole these images from a Youtube talk by Artur Bergmen of http://www.fastly.com. You should check it out because it’s funny, and it’s wisdom. I’ve had the honor to learn from many great masters in my years in the martial arts, and one of the lessons that really stuck with me is that the difference between a student and a master is the quality of the basic movements. As I go into 2012 again, I’m going to really re-focus on learning the basics as I go for another round of Cisco Trivial pursuit. ( CCIE renewal ). Understanding the basics of technology will help you in so many ways and solve so many of the other mysteries for you. We have been blessed with a career where we are rewarded for our insatiable curiosity.Respect how amazing a gift that is and embrace the learning opportunities which are placed before us everyday. How does this work? Why did that break? What happens when I touch this button?Hmmm. I wonder why it did that? Yes honey… I promise I’ll get that fixed! WARNING: PLEASE DON’T TEST OUT THESE THEORIES ON PRODUCTION NETWORKS. CUSTOMERS GET TESTY. 3) RTFM – Don’t ask stupid questions. There’s nothing more annoying to me when someone asks me a question that can be found in the first 5 hits of a simple google search ( http://www.lmgtfy.com ). A stupid question is one that you obviously have spent no time trying to figure out. One that it takes me one google search to find, or one which you should have known in the first place. I’m not saying don’t ask questions, because those often lead to design breakthroughs or really great learning experiences because of the nuance brought on by that particular angle of a question. But also, don’t be afraid to sit down and go through the manuals to see if it’s actually documented somewhere. Don’t be afraid to read through some blog posts, and also, embrace social media. Twitter has an enormous amount of shared wisdom and experience. If you are going to ask a stupid question; come prepared. Don’t waste someone’s time. Warning: Ask stupid questions on twitter with caution. Someone might call you stupid. If Rule #3 fails you and you can’t find the answer that you’re looking for, then you need to go back to rule #1. If you know your basics, there should be almost no problem that you can’t break into its composite parts and figure out what’s happening. 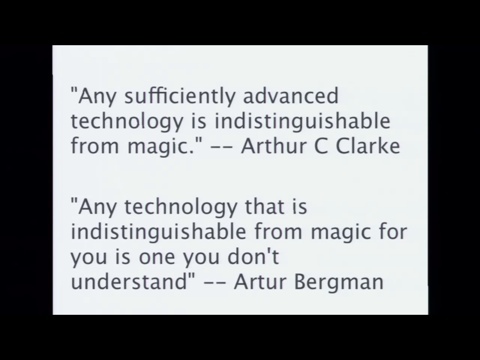 Networks aren’t magic. Packets don’t teleport from point A to point B, and there are certainly no gnomes, trolls, magics elfs, or unicorn tears. ( sorry guys! ). If you don’t understand how they work from the basics, you stand no chance of understanding how they work when things get complicated. VxLAN/NVGRE, LISP, and other overlay technologies are just that; Overlays. They don’t fix the underlying issues, and they can actually abstract the problem. As Artur says in the video, if you don’t understand the stack, you can spend a lot of resources trying to fix the problem at the wrong layer. This is the biggest issue I have with the overlays is that it will abstract the system and potentially allow the various data center factions to continue not-talking to each other. This is not a good thing. You will often find that network professionals were once programmers, or server/os guys, or even applications guys. ( Or in the case of Voice Network guys, they still are! ). As blah-blah cloud becomes more and more of a reality, and technologies like Openflow start to abstract the reality of the underlying system, it is becoming more and more important for SOMEONE to have an omniscient understanding of the datacenter. If anyone has any additional goals for the year, please feel free to post below. I’d love to hear.